← 67. Bridge of Allan. 11th Oct 2017. Braid Hills “No 1” is a wonderful public 18 hole golf course carved among the gorse and hillocks of Braid Hills on the south western edges of Edinburgh. It has magnificent views of the Edinburgh skyline towards the Firth of Forth and also the Pentland Hills. Although often misused, the term “gem” could well have been defined just for this golf course. It is sometimes described as “one of the best loved public courses in Scotland”, and a real gem it is. “The Braids” takes its name historically from the nearby Braid estate originally the property of the “de Brad” family, one of whom, Henri de Brad, was Sheriff of Edinburgh in the 12th century. The name has nothing to do with the famous course architect James Braid who, ironically, did not in any way shape his namesake course! It was appropriate to play here with Sheriff Frank Crowe, fully equipped with Tommy Armour irons, given that Henri de Brad, the 12th Century Sheriff of Edinburgh, is the origin of the Braid Hills name. The golf course was opened in 1893 and several golf clubs sprang up to accommodate the popularity of the sport with many of those clubs still affiliated: Edinburgh Thistle, Edinburgh Western, Harrison, Comiston Ladies and Braids United. The 1931 Open Champion Tommy Armour was a member at Edinburgh Western. Such was the popularity of golf, the nearby Braid Hills Hotel, immortalised in Muriel Spark’s ‘The Prime of Miss Jean Brodie’, originally had a Golf Room erected to serve the golfers playing the new Braid Hills golf course. It’s a relatively short course, but there are many blind or semi blind tee shots, and I would highly recommend buying the course planner, as some of the holes can be played with very different strategies, most notably the par 4 7th and 14th holes, where successful drives can be 60 yards wide on either left or right. Brian Fearon teeing off at the very difficult par 4 7th hole. Choose your line with care; my shot seemed the best drive but was never found! 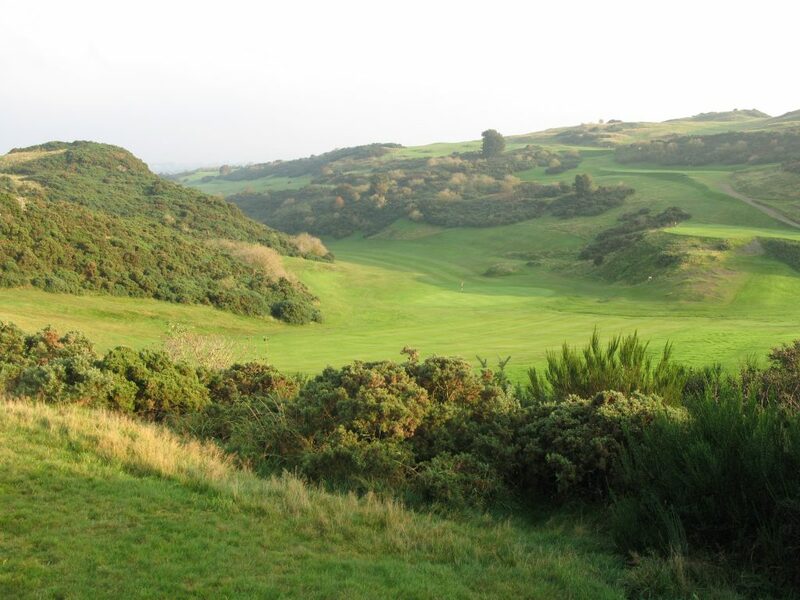 Although easily accessed from the city, whilst on the course if feels incredibly remote, especially in one of the holes surrounded by the gorse. 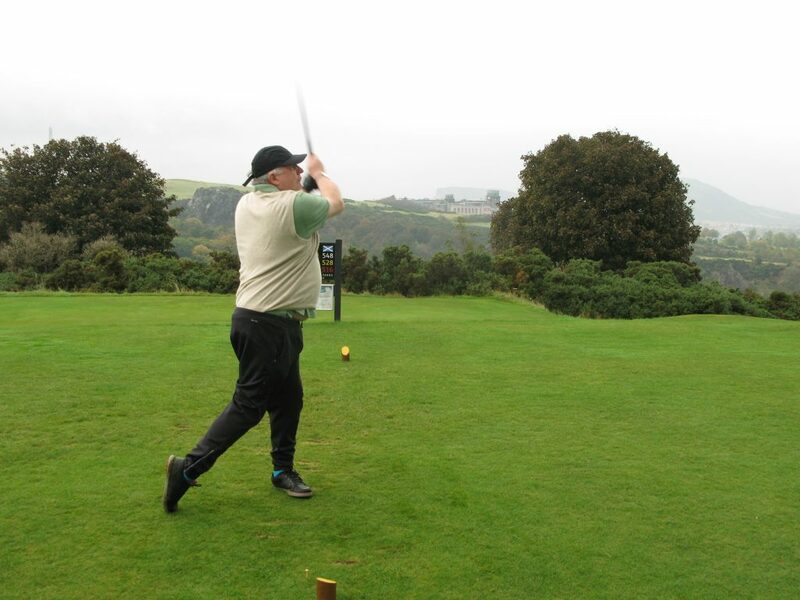 The main hazard on this course is the pervasive gorse bushes, and the need to get the correct alignment from the tee. If you play well off the tee here, you will score low, otherwise disaster awaits. 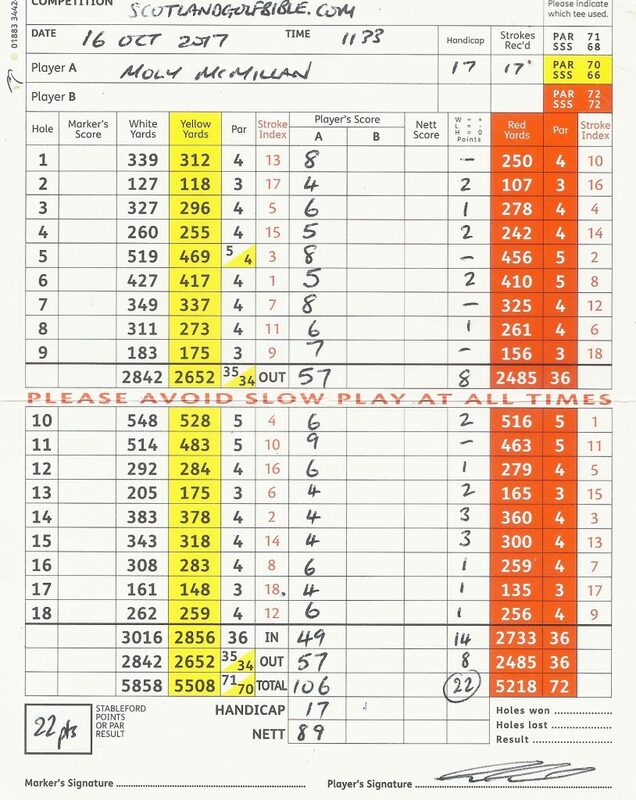 This is reflected abundantly on my card, where I had several disasters, resulting in lost balls. However, I found many more that I lost – on the 4th hole my own ball was the 7th I found. Make sure you remember the ball you played with! 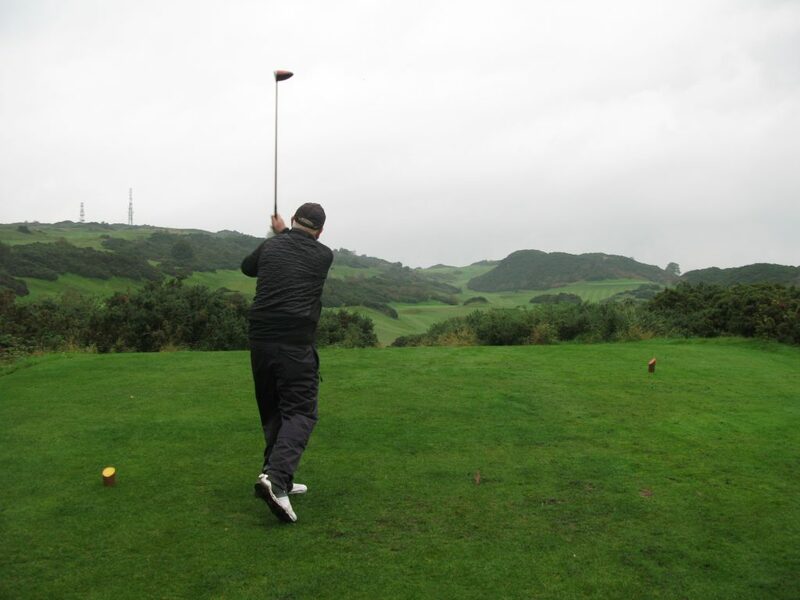 Also take care with approach shots, which often seem to take at least one extra shot here – this was evident from the 17th tee, which has about 140 yards of “valley” between the tee and green – you need to get up here to make par. The walk is quite hilly with some hazardous steps up and down from teeing grounds, but the walk is well worth it just to get to the 18th tee alone which must have one of the best views in Edinburgh. Even on a fairly misty day we were able to appreciate it. 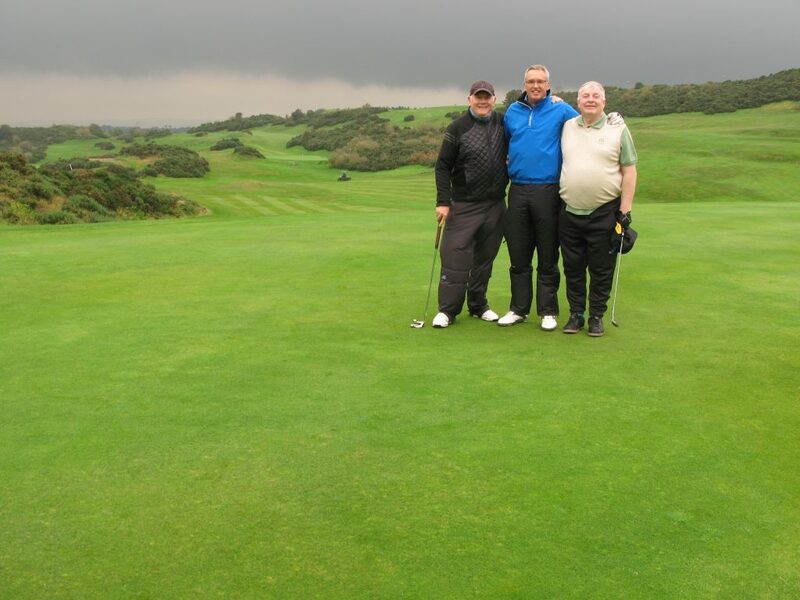 The course was in pretty good condition when I played with some colleagues from the Apex organisation. The greens were quite quick and the fairways good; there were some bunkers although they are quite spare and very basic in construction. A set of happy golfers on the characteristic 8th hole of Braid Hills. For the record, there once was a Braid Hills No 2 course of 18 holes, but that disappeared a few decades ago, and there is now nearby a small 9 hole course called Wee Braids and also a Braid Hills Golf Centre. This is a really great little golf course highly recommended. 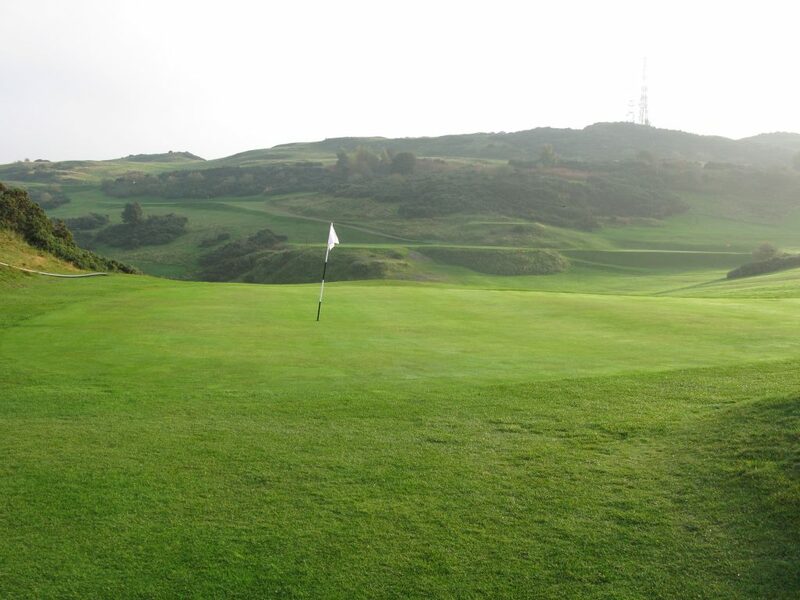 This entry was posted in 18 holes, 1851 - 1900, 4 star, 4 star, Bob Ferguson, Course Architech, Course Owned By, Course Quality, Course Type, Edinburgh & The Lothians, Heathland, Holes, Local Authority, Overall Value, Peter McKewan, Price, Region, When Course Established, £20 - £39. Bookmark the permalink.